Where the Jade River divides into three tributaries and the Jade Dragon Snow Mountain looms over the Black Dragon Pool, there you’ll find Lijiang Old Town. The old town, also known as Dayan Ancient District, is one of the two districts that make up Lijiang City, the other being the more modern part. As early as 1997, UNESCO recognised the historical importance of this city and, along with Shuhe Town and Baisha Village, made it into a World Heritage Site. These three ancient places, all within 15 kilometres of one another, are found in Lijiang County and together form what is left of the region’s ancient past. The old town itself is most notable for its unusual architecture and canal system. The majority of its buildings date back to the Ming (1368-1644) and Qing (1644-1912) dynasties and seamlessly combine elements of styles from the Han, Bai, Tibetan and Naxi ethnic groups. The houses tend to be made of timbre, with vivid carvings of people and animals on the doors and windows. The tributaries of the Jade River have been channelled into the old town via canals and waterways that lead it to basins or ponds, providing the townspeople with fresh running water. This ingenious water system has led to the old town being likened to Venice. Typically the ponds are divided into sets of three; one for drinking, one for cleaning vegetables and fruit, and one for washing clothes. Just don’t get them mixed up, or you’ll end up with a bunch of apples that smell like socks! It is believed the area was occupied as early as the Warring State Period (c. 476-221 B.C. 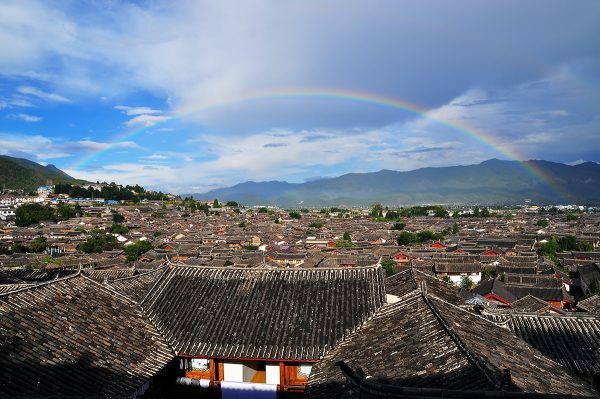 ), but the city itself wasn’t established until the late Song Dynasty (960-1279), when a Naxi family known as the Mu clan began building what we now know as Lijiang. They ruled for more than 500 years but were forced to submit to the Mongolians when the Yuan Dynasty (1271-1368) was established. However, they were allowed to continue their reign as “Tusi” or chieftains throughout the Yuan, Ming and Qing dynasties. Under their guidance, thereafter Lijiang flourished as one of the major trade hubs along the Tea-Horse Road that ran between Yunnan and Tibet. Bizarrely enough, the reason why Lijiang Old Town has no city wall is because when the character for the Mu family name (木) is surrounded by the character “wei” (囗) it makes the character “kun” (困), which means “to be trapped”, “beset” or “surrounded”. The family felt this was an omen, warning them that if they built city walls then the city would certainly be besieged. If you want to learn more about the family, the massive Mu Family Compound is open to tourists and provides great insight into the history of the city. Nowadays the old town is hugely popular with tourists and represents a stunning labyrinth of winding flagstone streets, bubbling canals and scenic parks. The Yuquan Park is a particular favourite with visitors and is home to both Elephant Hill and Black Dragon Pool. There are a number of temples in the park and from the central bridge of Black Dragon Pool you’ll be treated to the view of Jade Dragon Snow Mountain that has become iconic throughout Yunnan. If you fancy an afternoon hike, the Lion Hill overlooks the old town and at its summit you’ll find the wonderful Wangu Pavilion. This wooden building stands at 33 metres (108 ft.), boasts 10,000 dragon carvings, and is considered a masterpiece of Qing Dynasty architecture. From the summit, you’ll be rewarded with a panoramic view of both the city and Jade Dragon Snow Mountain. Near to Lion Hill, the Dongba Cultural Museum is the ideal place to learn more about the local Naxi culture and meet some of the last remaining people who can write Dongba script, the only known hieroglyphic writing system still in existence. Evidently the scenery around Lijiang was so beautiful that the locals could not find words to describe it, and so continued to use pictures instead! There are plenty of shops in old town where you can pick up a few souvenirs, such as burned wood carvings, yak horn combs, traditional Naxi clothing, art and writing samples of Dongba script, and Naxi handmade embroidery. With a plethora of Naxi, Tibetan and Sichuan style restaurants, it’s also the perfect place to sample a few of the local delicacies, including yak milk tea, yak milk yoghurt, yak steak, and the wickedly delicious Naxi fried white cheese. As the Naxi people know, the only thing better than cheese is deep fried cheese, and it’s covered in sugar! There are a number of cafés scattered throughout the town that serve Yunnan coffee and even a handful of Western-style restaurants and bars. At night, there are plenty of shows on offer to keep any visitor entertained. You can either take a trip to the Naxi Concert Hall and enjoy the sultry sounds of Chinese classical music played by the Naxi Orchestra, or make your way to Jade Dragon Snow Mountain Park and marvel at a performance of “Impression Lijiang”, which was designed by Zhang Yimou, the celebrated director of Hero and House of Flying Daggers. The old town boasts a variety of hotels and hostels that vary in quality. Some of the traditional houses have even been converted into boutique hotels by local families. They are the perfect place to immerse yourself in Chinese history without sacrificing any of your creature comforts!